Women inflict more punishment on their feet from improper footwear that can bring about unnecessary foot problems. Some of the problems result from high-heeled shoes (generally defined as pumps with heels of more than two inches), flats, or wearing the improper shoe size. High-heeled, pointed-toe shoes can cause numerous orthopedic problems, leading to discomfort or injury to the toes, ankles, knees, calves and back. Most high-heeled-shoes have a pointed, narrow toe box that crowds the toes and forces them into an unnatural triangular shape. These shoes distribute the body's weight unevenly, placing excess stress on the ball of the foot and on the forefoot. This uneven distribution of weight, coupled with the narrow toe box characteristic of most high heels, can lead to discomfort, painful bunions, hammertoes. and other deformities. The height of the heel makes a dramatic difference in the pressure that occurs on the bottom of the foot. the pressure under the ball of the foot may double, placing greater pressure on the forefoot as it is forced into the pointed toe box. There are comfortable and attractive "walking" pumps (also called "comfort" or "performance" pumps) for work and social activities, that blend fashion considerations and comfort, offering pumps with athletic shoe-derived construction, reinforced heels, and wider toe room. 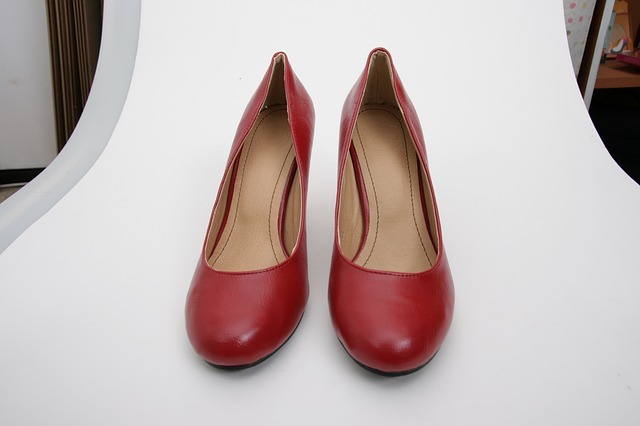 Low-heeled shoes (one inch or lower) with a wide toe box are the ideal choice for women. An ample toe box that can accommodate the front part of the foot is as important as the heel in determining fit. Another growing phenomenon for women is wearing ultra flats otherwise known as ballet flats. Many women are using these shoes as an alternative to high heels. However, these flats may even cause more damage than their opposite extreme. These shoes offer little if any support to your foot. Also, many of them have very soft soles which increase the risk of injury if you step on something sharp, as it can easily punctuate the shoe. Women can suffer painful plantar fasciitis (heel pain), fallen arches, bunions, hammertoes, ingrown toenails and more from these sorry excuses for shoes. They are called ballet shoes for a reason...they are intended for an activity, not an everyday shoe. Perhaps the best shoe for women is a walking shoe with laces (not a slip-on), a composition sole, and a relatively wider heel with a rigid and padded heel counter, no more than three-quarters of an inch in height.